Make your iPhone much special than your friends with the new scented case. Feel amazing..!! 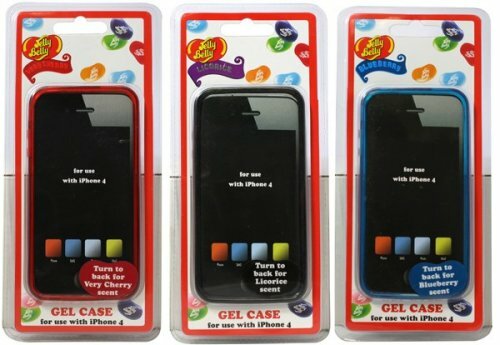 Jelly Belly, makers of the popular candy beans have launched scented covers for Apple and BlackBerry devices. Manufacturers claim “the Jelly Belly secret jelly bean recipe has been used to scent each case and the product is tipped as one of the hot crazes to hit shelves this Christmas”. Flavours available include Bubblegum, Very Cherry, Blueberry, Top Banana, French Vanilla, Liquorice, Grape and, of course, Green Apple and Wild Blackberry. The gel cases will fit the iPhone 4 and 4S models, and Blackberry 8520 and 9300 models. They are “in the same vibrant colours as the popular beans”, and also come with a 10g pack of Jelly Belly beans. The camera lens hole is also the shape of a jelly bean. The iPhone cases are available from today at £17.99 from The Carphone Warehouse; the BlackBerry cases will be available more widely and cost £15.99.